<! [endif]> <! [endif]>"KEEPING YOU WARM SINCE 1970"
Hardwoods are very dense and they have more BTU's (= heat) per volume as compared to softwoods. For all practical purposes hardwoods are the best choice for firewood. Tony's hardwoods include: Oak, Almond, Eucalyptus, Sycamore, and Walnut. Softwoods are less dense than hardwoods and tend to burn very quickly. They are good for starting a fire but will release a low amount of BTU's (= heat) per volume. Tony's softwoods include: Doug Fir, Pine, Cedar, Modesto Ash, Chinese Elm, and Amber Wood. Tony's Firewood mixed woods is a combination of our hard and soft woods. Why Do We Supply Mixed Loads? To get the best possible result from burning logs in an open fire, a good mixture of logs that will provide both heat and flame are recommended. For all practical purposes mixed woods are the best choice for home owners. Tony's Firewood sells all types of cooking woods to restaurants and the backyard chefs of Sacramento. Tony's cooking woods include: Apple, Cherry, Apricot, Peach, Oak, and Almond. Seasoned Firewood that has a moisture content less than 40% that will allow the wood to burn effectively and release the potential BTU's (heat). Wood that has been properly split and stored will promote the evaporation of water. In most areas of the country, especially the Northeast, it will take up to 12 months for split hardwood to be properly seasoned. Wood with more than 40% moisture content should not be burned for home heating. The minimum moisture content for optimal BTU's is no more than 20% to 30% moisture and as low as 10%. Below 10% the wood will burn too quickly. table. For our current stock, please click on a ï¿½Purchase Firewoodï¿½ button. 1Wood specific gravity and heat value are both necessary for calculation of fuel value. Both have been determined for most woods but data were estimated for a few uncommon species, based on local laboratory experience. Heat content of the wood you purchase (millions of BTU/cord). See the heat content section for details. Dryness or wood moisture content. This affects the burning efficiency. Basically, damp wood is not as efficient. Efficiency of your wood-burning appliance. With the optimum combination of factors you can receive up to 60 times more heat per cord of wood! At Tony's Firewood we will be glad to advise you on any aspect of firewood burning. Front view of 1/2 cord of wood. Always use a spark arrestor on the top of the chimney. Make sure the damper is open. Keep the log grate to the rear of the firebox directly under the flue. Keep a layer of ashes under the grate. Start the fire slowly for 2-3 minutes. Have your chimney inspected once a year especially if you burn pine. Store firewood away from your house. Store firewood away from insects and rodents. Store firewood on a pallet and off the ground for air circulation. Keep the wood dry and exposed to sun and wind - this continues the drying process. Rotate the woodpile to burn oldest wood first. This keeps insects and rot down. Lincoln, Auburn, Granite Bay, and Loomis. Tony's Firewood has the best firewood at the best prices in Sacramento. 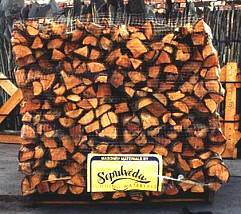 We sell Sacramento seasoned firewood and have thousands of satisfied customers.